Hello and a warm welcome back to my blog. I have had a quiet spell recovering from some fractures and it is great to be back drawing again. 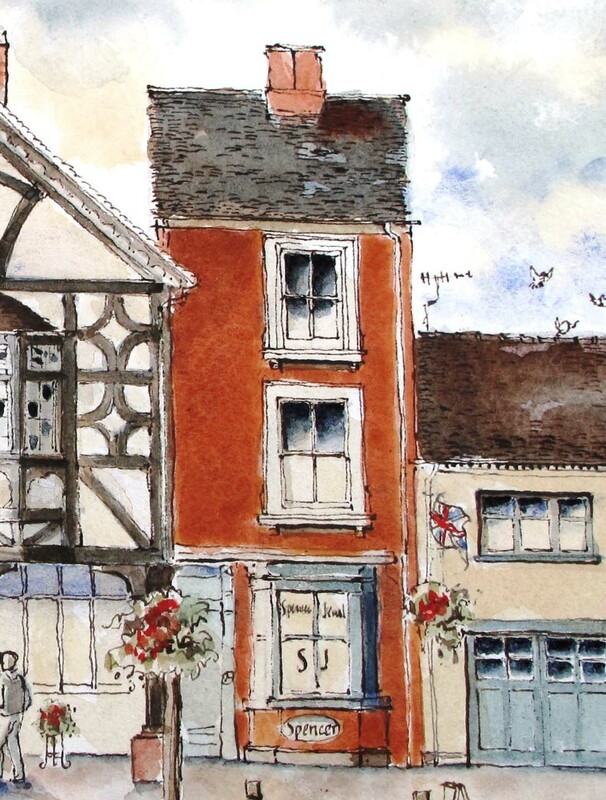 It has been a tonic to work on the second drawing of the rural Staffordshire town, High Street, Eccleshall. 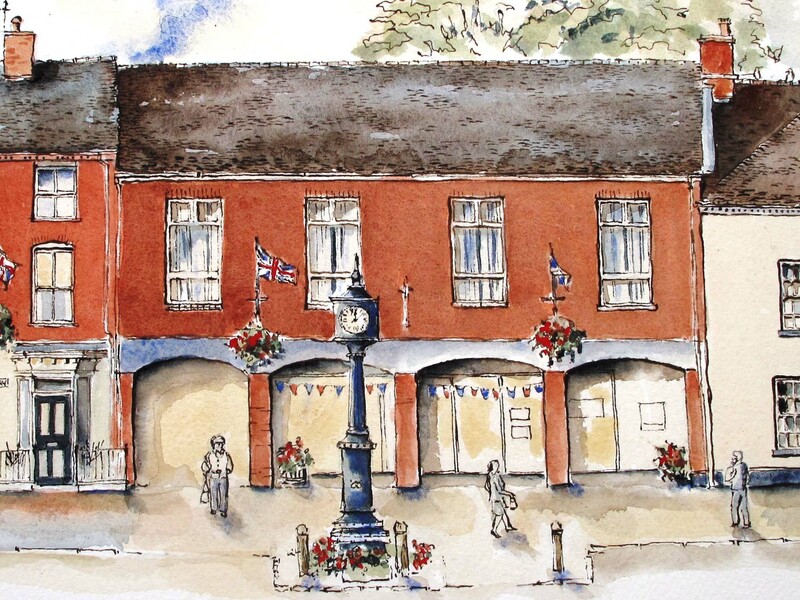 High Street forms part of Character Area One of Eccleshall Conservation Area. 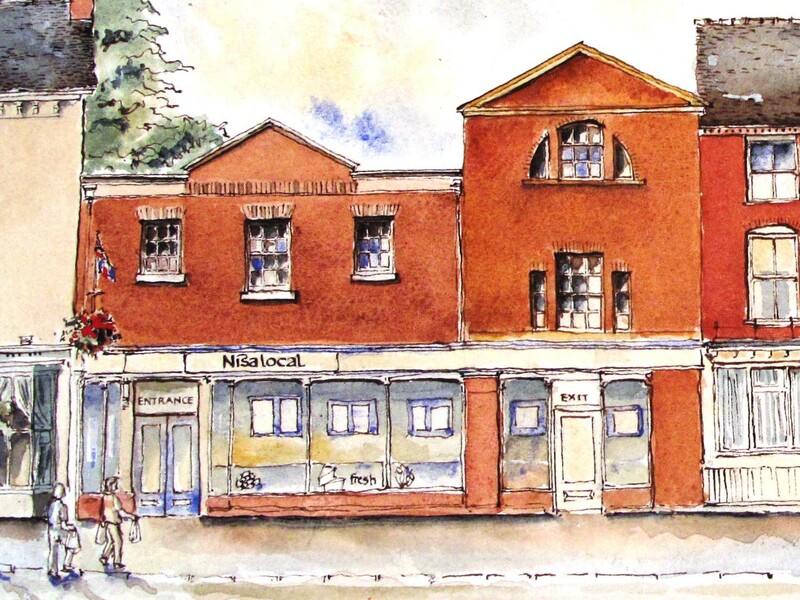 There are many listed buildings which are documented in British History Online but if you have any insight into the living history of these buildings, I would be delighted to hear from you, to include on the blog alongside the drawings. 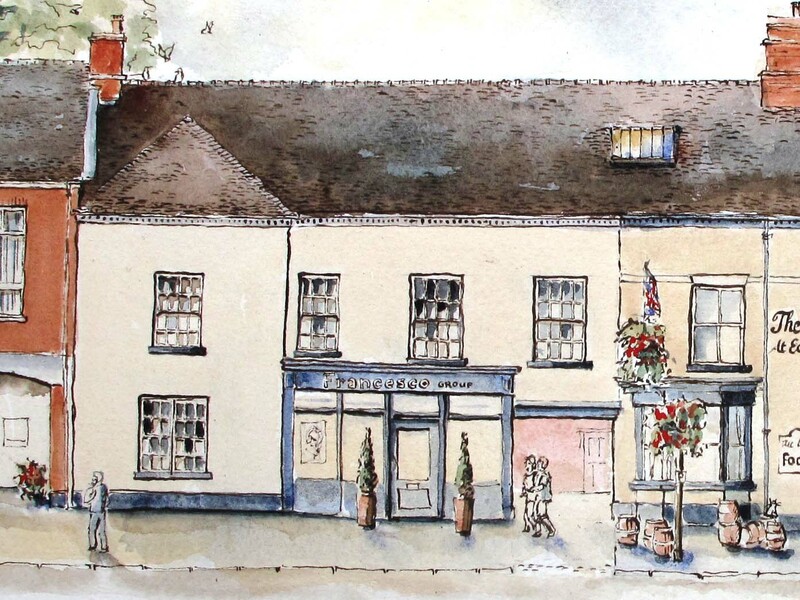 The drawing is 1.6metres long and the cropped images which follow read from No 2 High Street, where the High Street crosses Castle Street, (A519) up to No 30a. 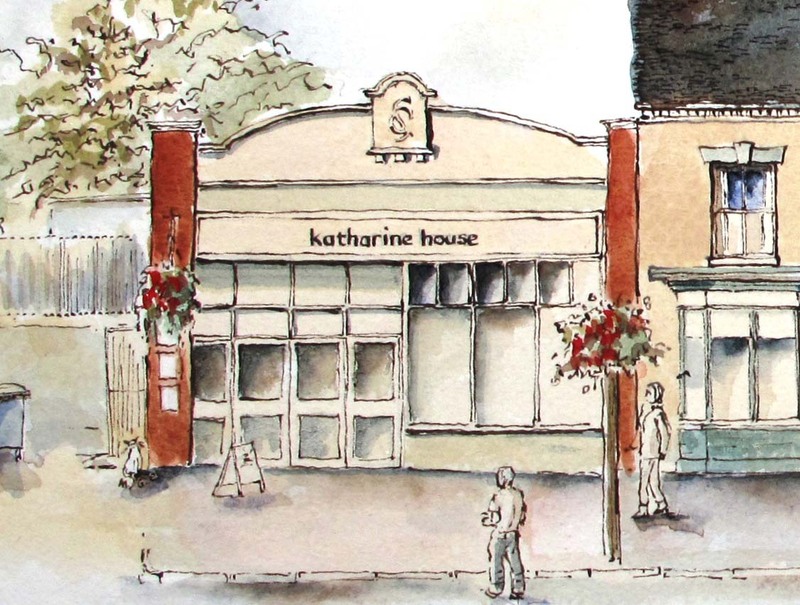 The street runs east to west and this drawing looks towards the north side of the street. 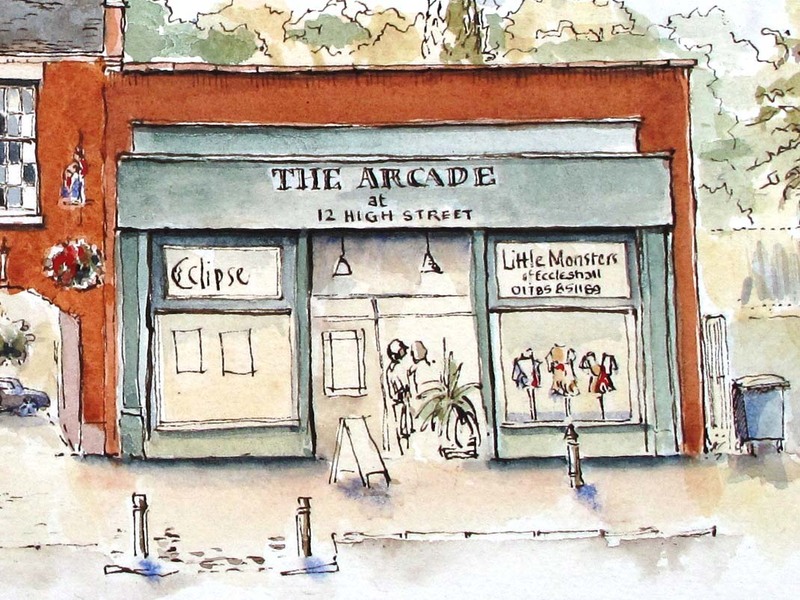 I still have one or two finishing touches to add to street level – if there is any small detail that you would like to see included, get in touch asap, before I scan the drawing! Wynns Independent Haulage Ltd below, marks the corner of High Street with Castle Street, a grade 2 listed building. 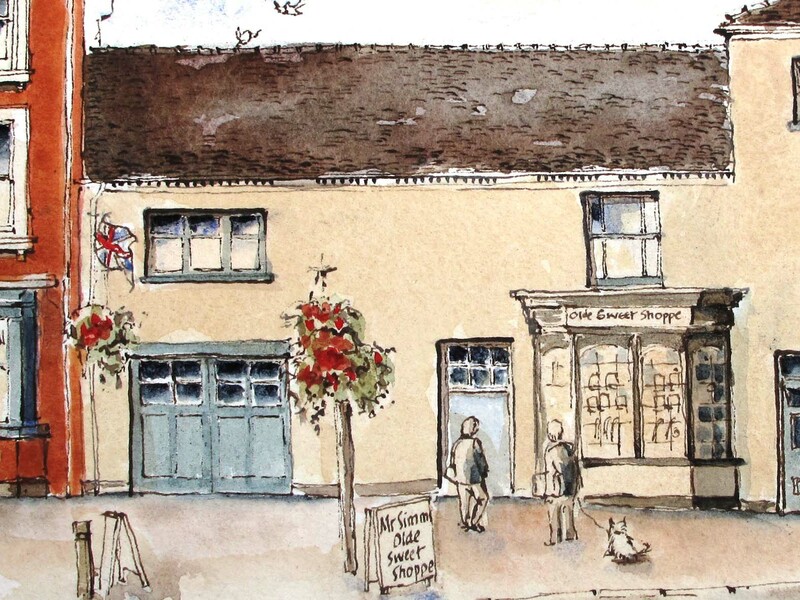 Mr Simms Olde Sweet Shoppe – No 2a High Street. 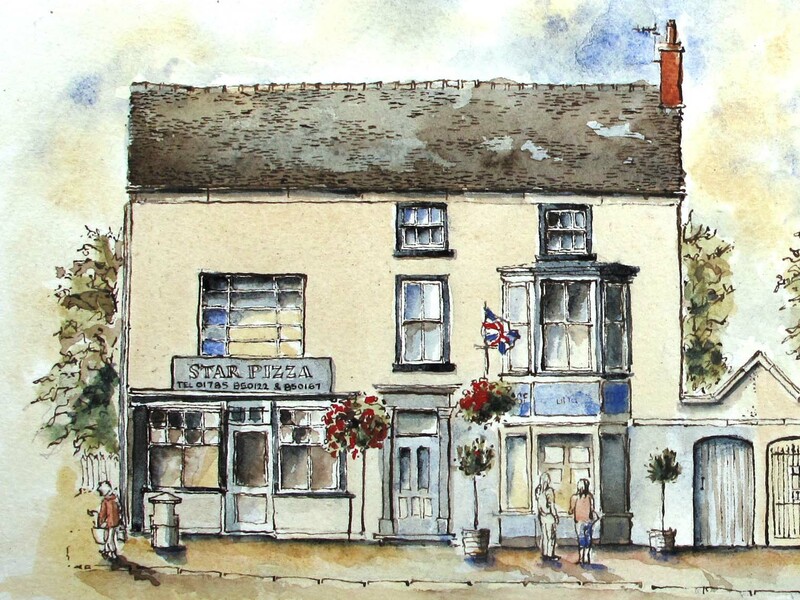 Spencer the Jeweller is another grade 2 listed building, dating back to the 18th century. 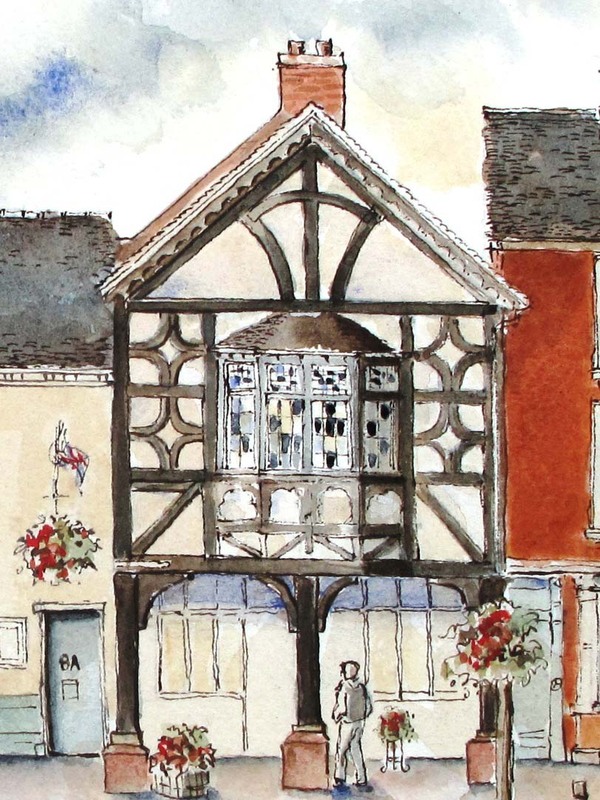 Wines Etc, is in a listed grade 2 timber framed building. 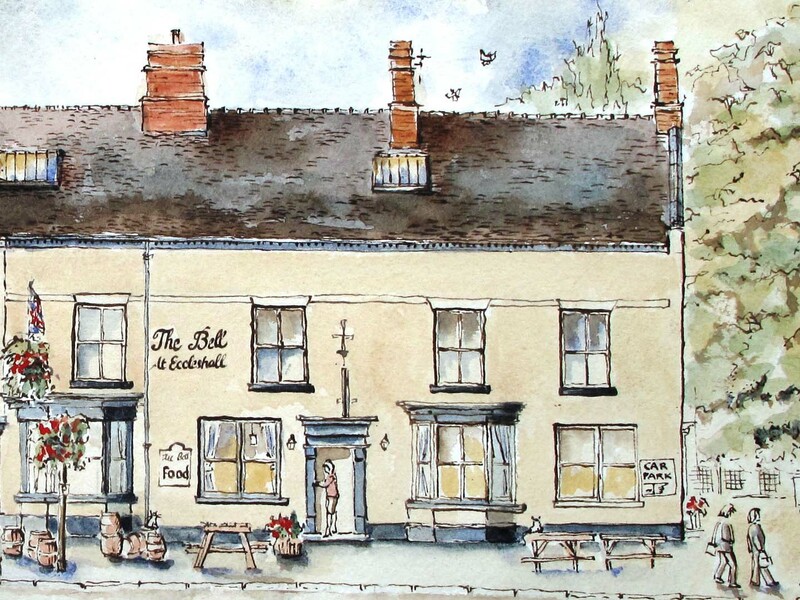 The Bell, an 18th century former coaching inn. 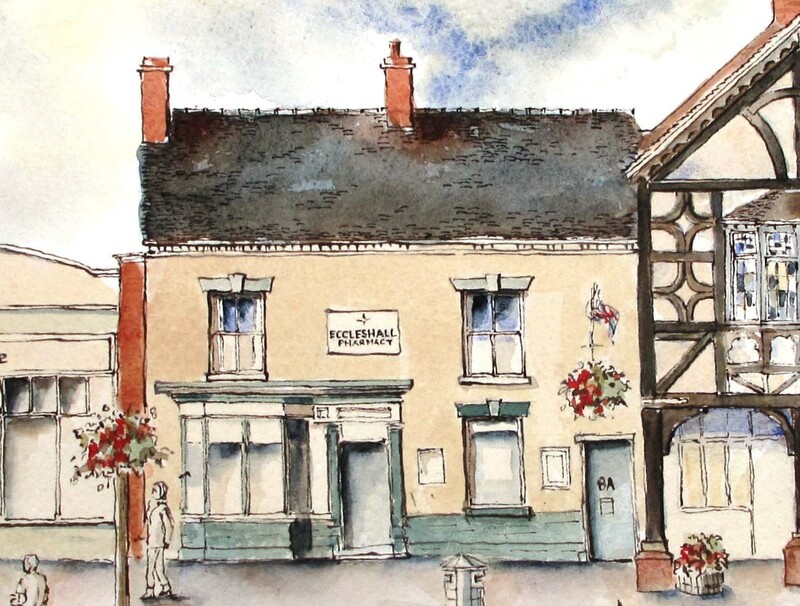 Tucked quietly between these listed buildings is Eccleshall Library, a much more recent addition. 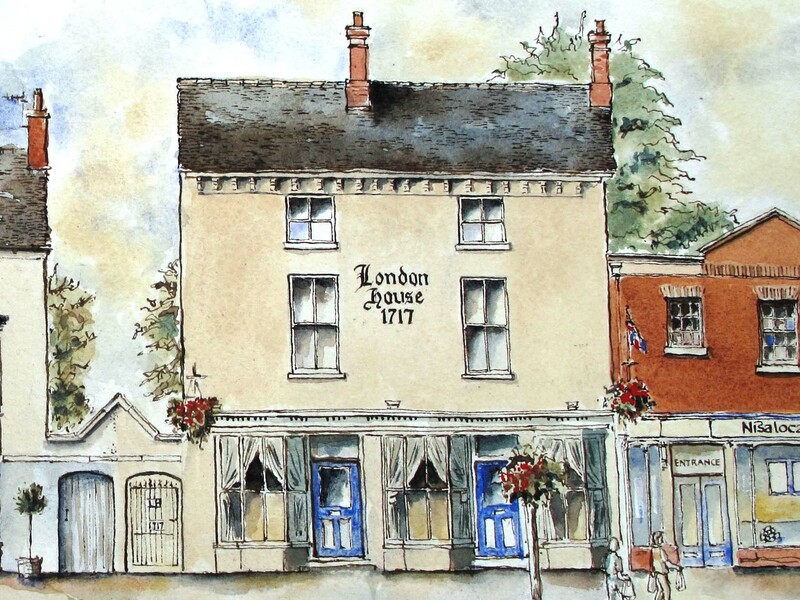 London House 28 High Street, Eccleshall is now home to an Indian restuarant. British Listed Buildings online comments that the internal staircase hall remains intact with “C18 joinery on first and second floors”, including “moulded handrail and square newels with pendants and long turned finials”. All that along with a curry sounds worth a visit! 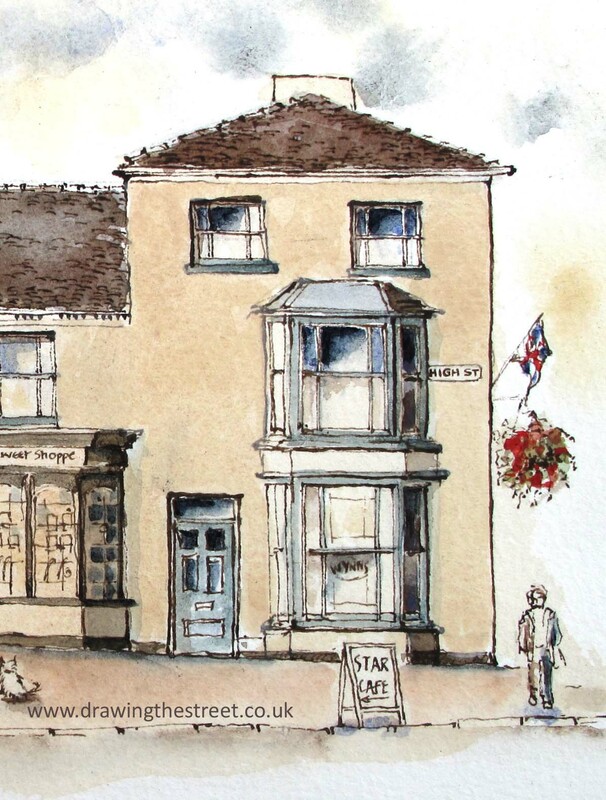 The drawing ends with Star Pizza, 30a High Street, Eccleshall and the independent estate agents Edge Goodrich. 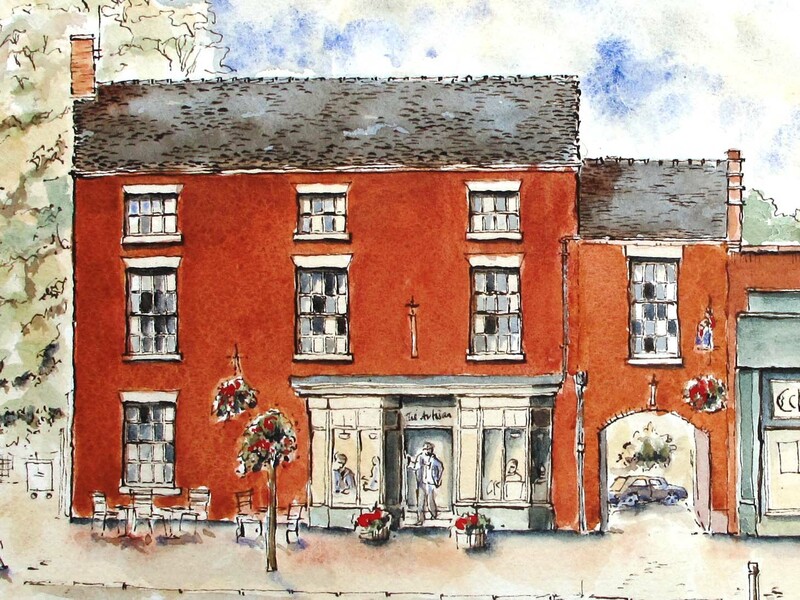 This entry was posted in architecture, drawing, Eccleshall Conservation Area, Streetscape art and tagged Architectural illustration, architecture, drawing streets, Eccleshall Conservation area, Eccleshall Pharmacy, Eclipse Hair Eccleshall, Edge Goodrich eccleshall, Francesco Group Eccleshall, Gallery at 12 Eccleshall, High St Eccleshall, katherine house eccleshall, London House, Mr Simms Sweet shop, Nisa Local Eccleshall, pen and ink, pen and ink drawing, Spencer Jewellers, Star Cafe Eccleshall, Star Pizza Eccleshall, The Arcade Eccleshall, the Artisan Eccleshall, The Bell eccleshall, Wines Etc Eccleshall, Wynns Independent haulage Ltd. Bookmark the permalink.